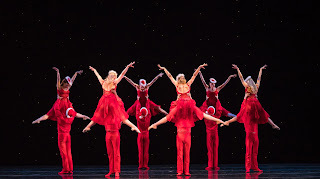 Social court dance, contemporary and traditional ballet, percussive rhythmical choreography, jazz, musical theater, comedy – together these genres make up 2016’s edition of Smuin’s The Christmas Ballet. With twenty-nine short vignettes split between two acts, this annual revue-style program speaks to range: the possibilities that exist within the performance and movement arts; the depth of talent and creativity within this iconic troupe; and a breadth and scope of choreographic vision, with work by company founder Michael Smuin, Choreographer-In-Residence Amy Seiwert, and current dancers Nicole Haskins, Ben Needham-Wood and Rex Wheeler. 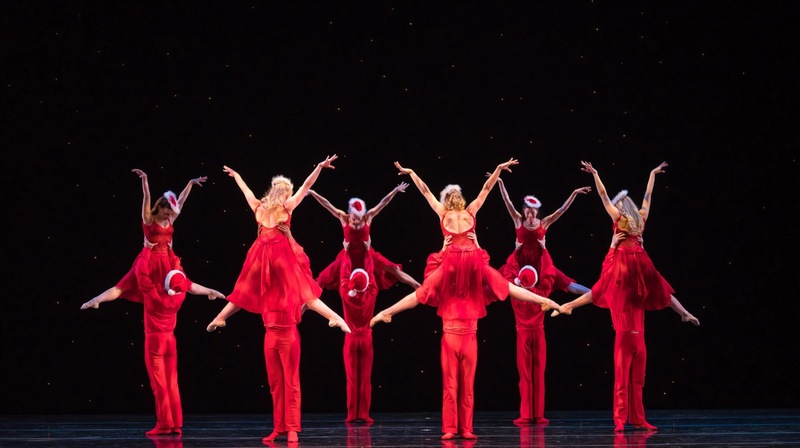 And in the midst of some particularly stormy weather, The Christmas Ballet brought warmth, fun and festivity to a very full house for the San Francisco opening Thursday at Yerba Buena Center for the Arts. As is their custom, Smuin started the night with the ‘Classical Christmas’ collection, an elegant, regal and well-curated mix of dance and music. Erin Yarbrough-Powell and Jonathan Powell delighted in Seiwert’s Noel Nouvelet, a sublime duet grounded in classical ballet technique, yet filled with unexpected twists, counter-balanced tilts and a significant use of demi-pointe. As always, Haskins sparkled in Smuin’s Zither Carol, a waltzy solo with balances that go on forever. For Unto Us A Child Is Born, another excerpt by Smuin, impressed with its celebratory nature, huge lifts, fast footwork, broad arabesques and emboîté turns. New company artists Valerie Harmon and Benjamin Warner led this dance with such grace and technique – their opening pas de deux, an absolute inspiration. With an array of contretemps and pas de basques, Wheeler’s We Three Kings (world premiere) has positioned itself to be a mainstay in The Christmas Ballet. This music shares a story of traveling, of a journey, and Wheeler aptly captured that narrative through dance, movement, patterning and stage architecture. And ‘Classical Christmas’ closed with Haskins’ buoyant, jubilant full cast work, Joy To The World. Act II’s ‘Cool Christmas’ is packed with audience favorites: Santa Baby, Christmas Island and guest artist and former Smuin company dancer Shannon Hurlburt in the Celtic tap extravaganza, Bells of Dublin. Seiwert’s River, the second world premiere on the program, communicated a range of emotions. This dramatically charged, lyrical duet (danced by Yarbrough-Powell and Robert Kretz) was all about change and shifting directions with its beautifully orchestrated turns and lifts. One of the closing sequences was particularly memorable - Yarbrough-Powell facing Kretz in a fifth position lift just slightly off the floor, the pair spinning in a circle. Haskins’ new choreographic offering, J-I-N-G-L-E Bells, brought together nostalgic social dance and contemporary ballet. There was even a humorous nod to the famous swan cygnet variation from Swan Lake. Traditionally ‘Cool Christmas’ concludes with Smuin’s wintery White Christmas. This year, Needham-Wood premiered a re-imagined version of Smuin’s finale, one brimming with community, joy and a hybrid of choreographic styles. And the snow still fell both onstage and in the center orchestra!